It’s actually not such a bad deal, then, an all-expenses paid trip to a progressive European capital city like Helsinki. Heck, even if the third string goaltender on the national team does not even get to make one single appearance on the ice, itself, it is still a marvelous travel experience and a phenomenal opportunity to do a little sight-seeing on the government’s dime. 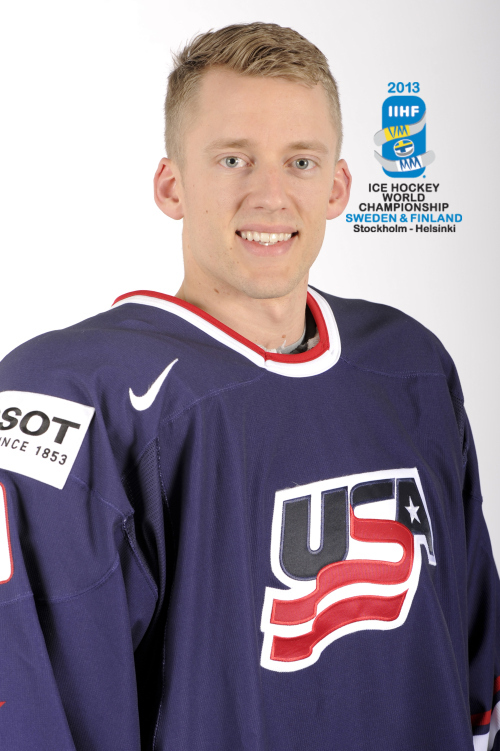 Such was the case for United States emergency netminder CAL HEETER of the American Hockey League’s Adirondack Phantoms at the 2013 IIHF World Championships in Finland. A nice little reward, then, for the rookie from Ohio State University who had himself, quite literally, an up and down season in his very first year as a professional ice hockey player. Indeed, after being assigned by the National Hockey League’s Philadelphia Flyers to their top farm club in the American Hockey League, the 24-year-old native of St. Louis shuttled back and forth between the Adirondack Phantoms and the Flyers’ affiliate in the lower-tiered East Coast Hockey League, the Trenton Titans, on no fewer than eight different occasions. 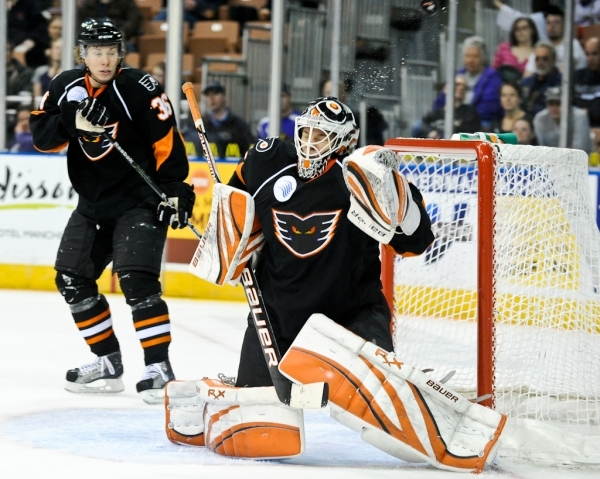 Oddly enough, Heeter still had more appearances for Adirondack (32 ga, 2.92 avg, .908 svpct) in the AHL this season than any of the other Phantoms goaltenders, a group which included NHL veterans BRIAN BOUCHER (16 ga, 2.57 avg, .905 svpct) and MICHAEL LEIGHTON (2 ga, 2.02 avg, .933 svpct) as well as 31-year-old career minor leaguer SCOTT MUNROE (31 ga, 2.78 avg, .913 svpct). Ultimately, Heeter was recalled to the NHL roster by the Philadelphia Flyers on the third of April with the Adirondack Phantoms still having nine games left to play on its 2012/13 AHL schedule and, with the newly-acquired shot-stopper STEVE MASON from the Columbus Blue Jackets in tow and Heeter occupying the role of third string goaltender, the Flyers formally closed out their abbreviated 2013 campaign on April 27th. 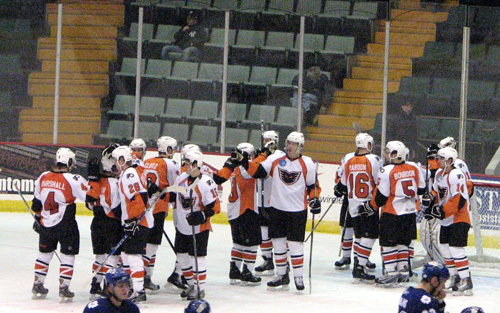 Altogether, from the beginning of October until the end of the NHL season in late April, the Philadelphia Flyers’ utility goaltender was on the roster of the AHL’s Adirondack Phantoms for 147 calendar days as compared to being on the Trenton Titans’ ECHL squad for only 30 calendar days; Heeter, who was never tabbed by any National Hockey League club and, accordingly, signed by Philadelphia as an undrafted free agent coming out of college, made eight appearances (3.18 avg, .900 svpct) with the Titans this season. The date for the initial registration for the players to be competing at the annual IIHF World Championships arrived on the second of May with Heeter being one of three goaltenders named to the United States national team by head coach JOE SACCO. The inexperienced Adirondack Phantoms backstop always figured to come after NHLer BEN BISHOP of the Tampa Bay Lightning on the American depth chart. Less predictable before the tournament in Scandinavia began was what would be a sensational performance by 19-year-old JOHN GIBSON, the second round choice (# 39 overall) of the Anaheim Ducks at the 2011 National Hockey League Draft who spent this past season with the Kitchener Rangers in the Canadian junior hockey system. 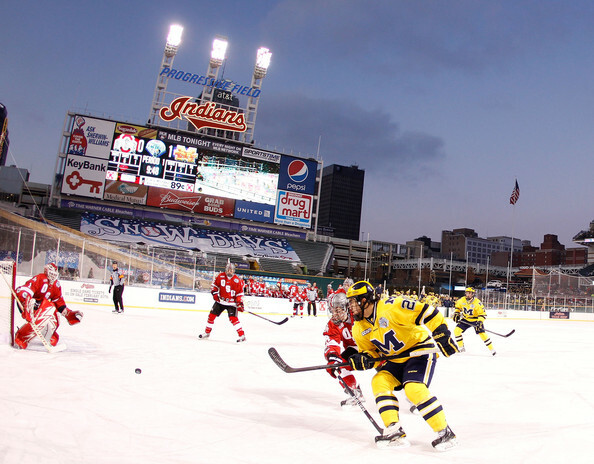 CAL HEETER made ninety-four appearances between the pipes for Ohio State University over the course of his collegiate career, including an outdoor ice hockey contest in plunging temperatures against the eternal arch-rival University of Michigan at Progressive Field in Cleveland; as a freshman, Heeter played in five games for the successful Buckeyes side that qualified for the annual NCAA tournament for only the sixth time in school history. BIG TEN hockey beckons … go PENN STATE! Adirondack Phantoms-Stuermer MARCEL NOEBELS (29), der ein Jahr mit den Krefeld Pinguine in der Deutsche Eishockey Liga frueher gespielt hat, verliert das Bully gegen Albany Devils-Angreifer KELLY ZAJAC (17), dessen aelterer Bruder fuer die New Jersey Devils in der National Hockey League spielt, waehrend eines American Hockey League-Spiels. Adirondack Phantoms-Stuermer MARCEL NOEBELS will zu werden, der erste deutsche Profispieler in der Stadt zu spielen, wo die beruehmte “Freiheitsglocke” von deutschen mehr als 235 Jahren versteckt war. Die zweite Mannschaft der Philadelphia Flyers verlassen New York Staat und werden Umzug in die Stadt Allentown, Pennsylvania irgendwann in dem naechsten Jahr. Ein neuer Palast des Sports, die Kalkulation von 177.1 Millionen US-Dollar (ungefaehr 135.335.500 Euro), wird voraussichtlich im Jahr 2014 abgeschlossen sein. Der Palast wird sehr in der Naehe einen alten Kirche auf Hamilton Strasse in Allentown stehen. Waehrend der amerikanischen Revolution wurde unsere “LIBERTY BELL” in der Kirche von September 1777 bis Juli 1778 versteckt. Damals waren die britische Armee von Koenig George III der amerikanischen Hauptstadt Philadelphia besetzen. 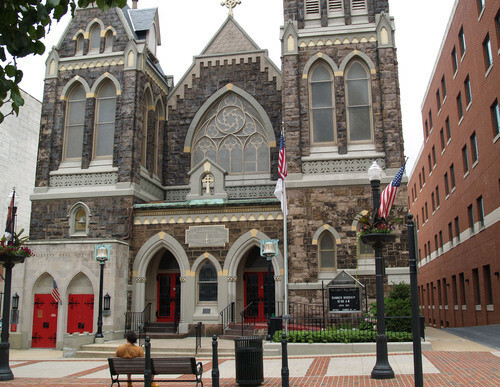 Aber ein lokale deutsche Soldat brachte die Freiheitglocke in einem Fuhrwerk der Kirche in Allentown, nachdem die amerikanische Armee der Kampf der Brandywine verloren. Zurueck in jenen Tage waren die ueberwaeltigende Mehrheit der Menschen in der gesamte Region deutsche Einwanderer. ZION’S REFORMED CHURCH (UNITED CHURCH OF CHRIST) in ALLENTOWN, PENNSYLVANIA — innerhalb der alten Kirche befindet sich ein historisches Museum und ein Replikat der Freiheitsglocke. Bethlehem ist der Nachbar-Stadt von Allentown und befand sich ein grosses Militaer-Lazarett waehrend des Krieges mit Grossbritannien. Heutzutage gibt es einen kleinen Eislaufplatz auf der Suedseite der Stadt. Die Adirondack Phantoms besuchen heute und wird auch Training haben, um mehr Interesse zu foerdern. Marcel Noebels spielt seine erste Saison als ein Profieishockeyspieler in Nordamerika. Der 20-Jaehrige begann das Saison mit der dritte Mannschaft der Philadelphia Flyers, der Trenton Titans und hatte sehr gut in der East Coast Hockey League gemacht. Noebels verdient eine Foerderung im Januar nach elf Tore und dreizig Punkte aus 31 Spiele in der ECHL. Keine Erstsemester-Spieler in der ECHL hatte mehr Punkte als Noebels, der zweimal mit Deutschland bei den IIHF Junioren-Weltmeisterschaften erschienen. Noch wieder, auf erste Noebels war sehr gut in der American Hockey League und schoss fuenf Tore in den ersten zehn Spiele fuer die Adirondack Phantoms. Aber der junge Deutscher hat nur zwei Mal seit dann getroffen. 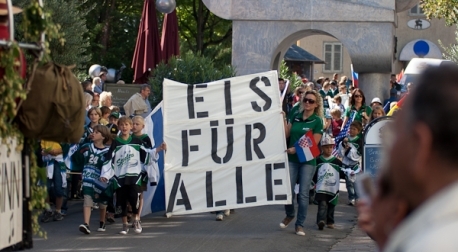 Es ist richtige, dass fuenf Mal mit Vorarbeit fuer die AHL-Mannschaft hat Noebels. Ingesamt, Noebels hat 7 Tore und 13 Punkte aus 26 AHL-Spiele fuer die Adirondack Phantoms in dieser Saison … nicht so schlecht. Noebels hat die erforderliche Groesse (191 Zentimeter und 89 Kilogramm), um in der Liga zu spielen. Er zeigt gute Disziplin mit nur zwei Minuten fuer die Adirondack Phantoms aber koennte auch mehr aggressiv sein. Es ist zu fruh zu sagen, ob Noebels kann mit den Philadelphia Flyers in der NHL spaeter spielen. Die Adirondack Phantoms wird Sonntag gegen den Hershey Bears, die zweite Mannschaft der Washington Capitals, in der Giant Center Eisarena im Zentrum von Pennsylvania spielen. 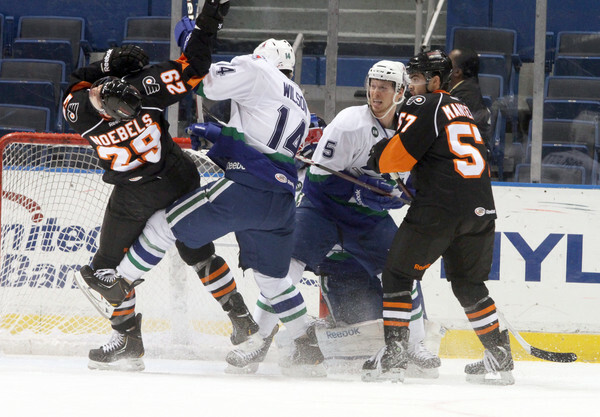 Der deutsche Jugend-Laenderspieler MARCEL NOEBELS (29) von den Adirondack Phantoms, der bei den Philadelphia Flyers in der National Hockey Leauge unter Vertrag ist, kaempft gegen den Connecticut Whale (Wal) waehrend eines American Hockey League-Spiels. Well, Seantor Pat Browne’s ‘revolutionary’ Neighborhood Improvement Zone law can, in fact, re-distribute wealth in Chairman Pawlowski’s City With No (Spending?) Limits … but it, indeed, can not do very much to help the hapless ADIRONDACK PHANTOMS accumulate significant points in the American Hockey League standings. With the 2012/13 AHL season almost three-quarters complete, it appears to be all but certain that, for the fourth consecutive year, the Adirondack Phantoms will not be participating in the American Hockey League’s post-season playoffs. Maybe, with a bit more legislative genius generated by heroic and inspirational politicians, before the soon to be re-named LEHIGH VALLEY PHANTOMS complete their move to the magnificent $ 177.1 million dollar Palace of Sport, er, ah, PPL CENTER in Allentown, that is … Senator Browne and Chairman Pawlowski could write and then ramrod through some new laws in order to guarantee that the Lehigh Valley’s state-supported AHL outfit always make the playoffs and, therefore, always have at least a few extra lucrative home games annually at the transformative downtown arena on Seventh and Hamilton. Brave as well as noble mothers and children heroically march with a banner that reads “ICE FOR EVERYONE” to demonstrate the little German community’s solidarity with Stadtwerke Bietigheim-Bissingen GmbH, the local public utitilies company that just spend an eye-opening 18.0 million Euros to construct the brand new EgeTrans Arena, the all-important site of the critical XXII Winter Olympic Games – Group D Qualification Tournament involving the host nation, Austria, Italy and the Netherlands. It was back in late September of 2012 that PRAVDA, er, ah, THE MORNING CALL, finally acknowledged that the actual pricetag of Chairman Pawlowksi’s spectacular and transformative PALACE OF SPORT was now calculated to be a staggering $ 177.1 millon dollars in the article entitled “ALLENTOWN PA BLOCK WILL COST 272 MILLION” (09/25/12). 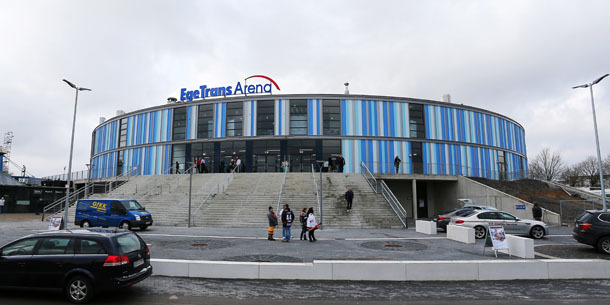 The recently-opened EGETRANS ARENA in the southwestern German state of Baden-Wuerttemberg offers a shocking contrast in terms of construction costs that could prove a bit embarrassing to the esteemed elected officials in the City With No (Spending?) Limits, the all-Democrat Rubber Stamp Council of Apparatchiks not withstanding. This because 18.0 million Euros actually forks out to roughly $ 24,000,000 in United States currency. And so there it is … spin-cycle, please. In other Palace of Sport news, the ADIRONDACK PHANTOMS continue to flounder at the bottom of the standings and are a solid bet to miss the American Hockey League playoffs for a fifth consecutive season. The pride and joy of the Philadelphia Flyers are currently languishing 15th and dead last in the AHL’s Eastern Conference. Having accumulated just 39 points from 45 games so far, the Phantoms rank 29th out of 30 AHL teams in Adirondack’s first year with former NHL coach TERRY MURRAY at the helm. 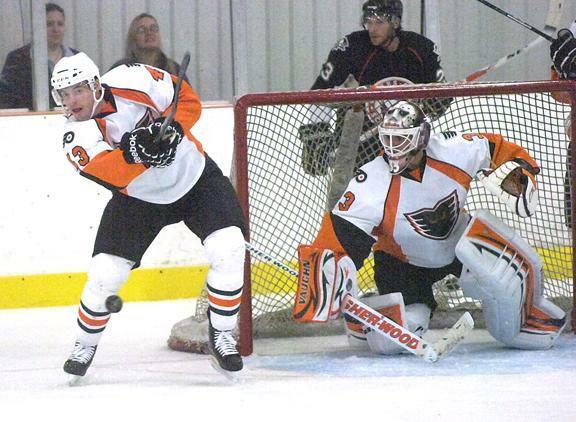 One Phantoms player who has done reasonably well since a relatively-recent recall from the Trenton Titans of the East Coast Hockey League would be German rookie MARCEL NOEBELS. The 20-year-old center has scored five goals in only 14 AHL games for the Adirondack Phantoms club that has scored the second fewest goals of any team in North America’s premier minor league circuit. 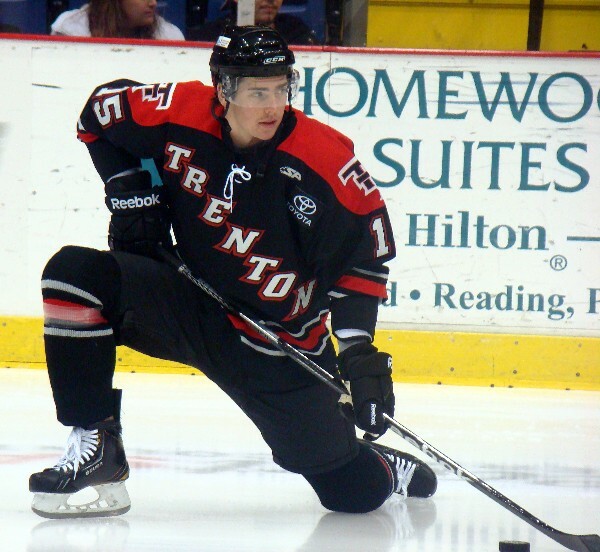 A fourth round selection (# 118 overall) of the Philadelphia Flyers at the 2011 NHL Draft, Noebels totaled 11 goals and 30 points in 31 ECHL games for Trenton and was leading all rookies in scoring before earning a promotion to Adirondack just after the New Year. Whether or not Noebels, who notched one goal and three points for the Krefeld Pinguine as a 17-year-old skating against experienced senior professional players in the elite Deutsche Eishockey Liga before spending two years in the Canadian junior system, ever appears at the magnificent Palace of Sport in Allentown remains to be seen. 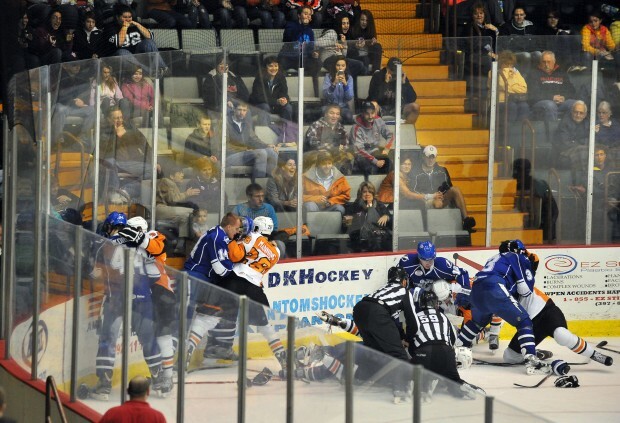 American Hockey League rivals in upstate New York, the soon-to-be-moving ADIRONDACK PHANTOMS and SYRACUSE CRUNCH, have a heated yet healthy and robust debate over the role of Big Government in building lavish sports arenas for privately-owned minor league hockey teams at the expense of already financially-strapped ordinary taxpayers during an AHL contest earlier this season. Adirondack Phantoms goaltender JASON BACASHIHUA (33) watches intently as New Hampshire native ANDY THOMAS (43), the former University of Denver defenseman who has already signed to play with Slovenian club Olimpija Ljubljana in the Austrian top flight this upcoming term, clears the puck from danger during an American Hockey League contest with the visiting Scranton/Wilkes-Barre Penguins last season in Glens Falls, New York. First it was the Swede JOHAN BACKLUND of Finnish club Karpat Oulu visiting for the European Trophy tournament. Next up will be the American JASON BACASHIHUA, a former National Hockey League first round draft choice who is the new starting goaltender for the Straubing Tigers of the Deutsche Eishockey Liga. 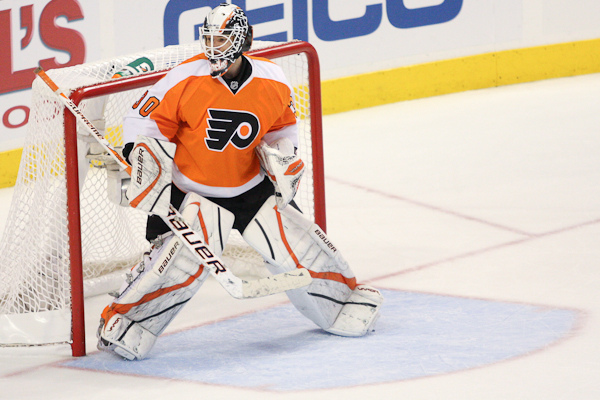 Now, if the Canadian MICHAEL LEIGHTON, a Stanley Cup Finalist with the Philadelphia Flyers a few years ago in 2010, could only somehow ink a quick contract with Adler Mannheim and make it over to Germany by Sunday … then the two-time defending D.E.L. champion EISBAEREN BERLIN will have themselves a unique hat trick of sorts involving three goaltenders who stood between the pipes for the playoff-less Adriondack Phantoms in the American Hockey League last season. Veteran goaltender JOHAN BACKLUND of Finnish elite league club Karpat Oulu, the 31-year-old former Philadelphia Flyers farmhand who started six of Sweden’s nine games at the 2007 IIHF World Championships hosted by Russia, turns aside a shot during the European Trophy contest with HC Plzen in the Czech Republic earlier this summer. Fellow Swedish defenseman ERIK GUSTAFSSON (36), the undrafted free agent from Northern Michigan University who skated in 30 NHL games for the Philadelphia Flyers last season, watches his countryman JOHAN BACKLUND of the Adirondack Phantoms fight off a puck during an American Hockey League contest a couple of years ago. The Philadelphia Flyers signed undrafted goaltender JOHAN BACKLUND from Swedish club IK Timra in the summer of 2009 but the native of Skelleftea never was able to keep a regular roster spot at the National Hockey League level. 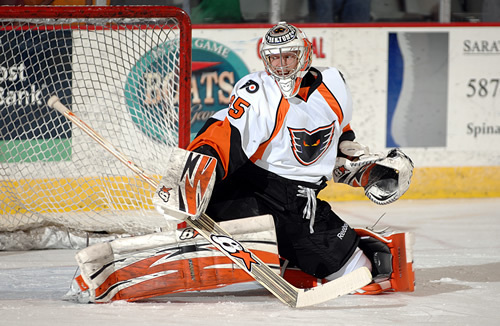 And so Backlund, who was slowed by injuries in training camp a year ago and ended up going out on loan to Finland in mid-winter, spent most of his time in the Philadelphia organization as the first choice netminder for the Adirondack Phantoms in the American Hockey League. Backlund’s brief NHL experience encompasses exactly one regular season appearance for the Flyers during the 2009/10 campaign in addition to one other in the playoffs that year, as well. The Michigan native Bacashihua, of course, will be making his European professional debut when the visiting Straubing Tigers visit the 02 World Arena Berlin in the German capital city on Friday to face-off with the juggernaut Eisbaeren, who have captured the Deutsche Eishockey Liga title four of the past five seasons under the tutelage of American trainer DON JACKSON. One opposing player that the incoming Bacashihua, who played for three different American Hockey League teams — Hershey Bears, Lake Erie Monsters and Adirondack Phantoms — the past three seasons, should be familiar with in this D.E.L. contest on opening night is Eisbaeren Berlin’s new offensive-minded defenseman MARK KATIC, the former New York Islanders third round draft pick who spent most of the last three years with the Bridgeport Sound Tigers in the AHL. Straubing Tigers goaltender JASON BACASHIHUA made three appearances for the United States national team at the 2006 IIHF World Championships in Latvia and one more at the 2007 IIHF World Championships in Russia but found himself fourth on the depth chart in a Philadelphia Flyers organization which boasted the Russian pair of Ilya Bryzgalov and Sergei Bobrovsky as the two regular netminders on the National Hockey League roster at this time last year; the one-time St. Louis Blues puck-tamer with 38 NHL games under his belt would also be limited to second-string duty in the American Hockey League with the Adriondack Phantoms during the 2011/12 schedule, as well, and has now crossed the Atlantic Ocean in search of more playing time. With the release of the last-ever American Hockey League season schedule involving the departing ADIRONDACK PHANTOMS, surely it did not escape the attention of the notorious N.I.Z. Cheerleaders that the Philadelphia Flyers’ AHL affiliate will be making five tantalizing appearances in the COMMONWEALTH OF PENNSYLVANIA after the 2013 New Year. By then, of course, it is hoped that construction of the transformative (if not expensive) PALACE OF SPORT will be in full swing on Hamilton Street thanks to the sale of $ 220.0 million dollars in bonds graciously offered by the Allentown Neighborhood Improvement Zone Development Authority or whoever it was, to be quite frank. At this point in time, though, the status of the whole construction process remains as confusing and unclear as ever with the news of the possible addition of the historic Americus Center Hotel to the so-called Neighborhood Improvement Zone. To make a long story short, the Pennsylvania Department of Revenue has stated that bonds providing the financing for the $ 158.0 million dollar Palace of Sport cannot be sold unless Senator Browne’s brainchild, the N.I.Z., has its borders withdrawn to include the hotel in question. “The city’s arena project is more than three months behind schedule and city officials are reluctant to embark on any changes that would further delay the project,” writes MATT ASSAD of THE MORNING CALL (8/20/2012). TAKING A GAMBLE ON ICE HOCKEY IN GOOD OLE’ A.C. —— The nomadic ADIRONDACK PHANTOMS and their I-87 rival in scenic upstate New York, the ALBANY DEVILS, will bring their intense battle for American Hockey League superiority to Atlantic City on January 20, 2013. The capital city of the Empire State would be, of course, the home of the New Jersey Devils’ AHL affiliate. The two visiting foes will face-off after the 2013 New Year at the beachside BOARDWALK HALL, the facility formerly known as the Historic Atlantic City Convention Center which has a reported capacity for 10,500 ice hockey spectators and hosted the 2012 AHL All-Star Game despite not having an actual team in the league itself. Having departed the Commonwealth of Pennsylvania after the 2008/09 campaign, the incoming Adirondack outfit will definitely be looking to re-ignite their intra-state rivalries involving the historical Hershey Bears as well as the Scranton/Wilkes-Barre Penquins in the American Hockey League with an eye towards the future. Certainly, the good people marketing season tickets for the fledgling Allentown Phantoms and their inaugural 2013/14 AHL campaign at the newly-built Palace of Sport will be highlighting these contests in a bid to bolster sales and justify such massive government expenditure on a minor league ice hockey rink. A chance to sample the goods soon to be available, so to speak. There is no question that, in the past few years, the AHL affiliate of the Philadelphia Flyers has left a lot to be desired. New head coach TERRY MURRAY, the two-time winner of the Eddie Shore Trophy as the AHL’s Best Defenseman while with the then-Flyers’ affiliate Maine Mariners who does have extensive experience behind the bench at the National Hockey League level, is tasked this season with the challenge of steering the traditionally lackluster Adirondack Phantoms to their first playoff appearance, ever. Whether or not the club from upstate New York can take the Commonwealth of Pennsylvania by storm or be crushed under the weight of the obvious pressure is a question which can only be answered by time. One thing is a given — both the Bears and Penquins will be anxiously waiting to warmly greet the future in-state AHL neighbors. Adirondack Phantoms defenseman BRANDON MANNING (28), the 22-year-old, undrafted prospect out of Prince George, British Columbia, who made four appearances in the National Hockey League with the Philadelphia Flyers as a rookie professional last season, excitedly moves the puck up ice while trailing Scranton/Wilkes-Barre Penquins winger BRANDON DE FAZIO (24), the undrafted native of Ontario who comes via Clarkson University in Potsdam, gives frustrated chase during the American Hockey League contest at the Glens Falls Civic Center in upstate New York last spring.